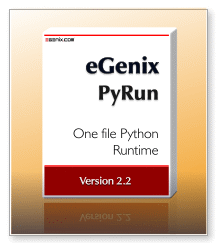 eGenix PyRun is made available by eGenix under a Python-style Open-Source license. eGenix PyRun consists of a build mechanism to build the PyRun run-time and a set of helper modules/tools that get included in the resulting binary. The tools and build mechanism are covered by the eGenix.com Public License Agreement 1.1.0 which is an Open Source license based on the CNRI Python license. Since PyRun also pulls in Python during the build process to create the run-time, the respective Python license of the underlying Python source distribution also applies to the resulting pyrun binary. eGenix PyRun also ships with a copy of the freeze tool, which is covered by the Python license. In simple words, you are free to use the software without paying fees or royalties as long as you give proper attribution and keep both license documents together with the software. If you combine eGenix PyRun with your software, you are not required to distribute source code of your combined solution (no copy-left). Please see the included license documents for full details and consult a lawyer if you have legal questions.